This is the fifth and final episode on the Battle of Jutland and last time we left off with the sun setting on the battle after Jellicoe turned away from Scheer and his destroyer torpedo attack. The battle would not be over when the light started to fail though, the pursuit would continue. There was still a chance that the British could either find the Germans in the dark or in the morning, preventing them from getting home. If Jellicoe and Beatty could do this there would be another opportunity for the British to use their superior numbers against the german ships. In this episode we will talk about the actions that occurred during the night, these actions were very confusing to the people participating in them as this was a time before radar. There were special tactics and equipment that the ships had specifically designed for night fighting but it would be a time when the British numbers counted for every little. Since this is the last episode on Jutland we will also do a final accounting of the lives and ships lost during the fighting. We will then finish off these episodes with some discussion about the huge volume of published literature on the battle from both during and after the war. If there is one thing that British society of the early 20th century liked to discuss it was the performance of the Royal Navy, and in the battle of Jutland they found enough content to keep that discussion going for a generation. As darkness fell on the ships the British were pretty okay with their positions. Jellicoe in particular thought things were going well, although he did not have the full information about the losses in the battlecruiser which might have changed his mind. In particular he did not know yet that the Queen Mary and Indefatigable had exploded. At the moment there was a more important question on Jellicoe's mind, where would the Germans go? Everything knew they would be heading home, but there were three different routes that they could take to get there. The first option would be for Scheer to steer southeast towards the Horns Reef then back into the jade through some minefields. The second option was also to the southeast towards Ems and then east to the Jade. The third option was to just go directly to the south to go to Heligoland and the Jade. Jellicoe had to guess which one Scheer would head to and then try to cut him off on his way. With where he thought Scheer was he was already in position to block the Germans getting to Horns Reef, or so he thought. Jellicoe decided to head south in the hope of staying between Scheer and Ems and also with the goal of getting between him and Heligoland. After decided on the general direction for the fleet to go Jellicoe also sent out a few orders to prepare his ships for the night. The first sated that he had no intention to fight during the night. He actually wanted to actively avoid fighting during the darkness and instead holding off until the morning. Both the Germans that the British agreed that the Germans were better equipped and trained for night fighting, and as I mentioned the British numbers would be far harder to bring to bear. Jellicoe also shifted his formation out of the long line they had been in earlier and instead into 3 columns of 8 ships each, with each column steaming a mile apart. The hope was that they would be far more maneuverable as a fleet in these positions. Beatty changed his course to stay ahead of Jellicoe on the same course. Through the night the men were kept at their action stations, just in case anything should happen. On all of the ships food in the form of sandwiches, corned beef, and tins of salmon were brought around to the men, who I am sure were thankful for the sustenance. There was also a helping of Royal Navy hot cocoa which the sailors called Kai. My research into Kai and its makeup have led mostly to dead ends, and if anybody knows the exact makeup of this drink please please contact me, my most authoritative source is a random person on a random internet forum that gives the following recipe for the drink. Take a small bar of very dark chocolate and a mug of hot water, put this in a saucepan and heat until the chocolate is melted, add a tin of condensed milk, bring to boil and then serve in mugs, copious amounts of sugar may be necessary. I believe this creates a mixture that is quite thick and I bet it was quite tasty and its warmth was welcome in the middle of the cold North Sea late at night after a day of fighting. On the German Side, Scheer also had to decide where he was going. Before he made this decision and changed course both fleets were actually sailing in exactly the same direction, with the British slightly ahead and to the east. Scheer decided that he should head to Horns Reef and at 9:10PM he sent out orders to all the ships to put this into effect "Battle fleet's course southeast by a quarter east. This course is to be maintained. Speed sixteen knots." Scheer was hoping to slip past the Grand Fleet completely unnoticed but he knew that he might have to fight during the night. The inclusion that the course was to be maintained meant that no matter what happened the ships should keep sailing, Scheer was willing to sacrifice any losses during the night to reduce the chance of another daylight action. After the Germans made their course change the two groups of ships were essentially making two sides of a very long and narrow V. They Germans were going slightly faster but the British started out a bit ahead. For the rest of the night the two groups would slowly close in on each other with the British passing through the bottom of the V before the Germans, and then the Germans passing through behind them. This meant that he V would become and X without either side really knowing about it. All through the evening they were intercepting the German wireless messages that Scheer was using to direct his ships. Jellicoe was handed the information at 10:41PM. This would be when the consequences of the earlier miscommunications would be felt. If you remember earlier there had been false reports sent to Jellicoe that the German main fleet was still in port, when this and other messages were proven to be completely false Jellicoe almost entirely lost faith in the intelligence he was getting from the Admiralty. So now when he was given knew information from the same source he was very skeptical. While he probably would not have changed his course either way, it did mean that when there was firing in the rear of the British Fleet during the night Jellicoe did not believe that it was the German main fleet, instead he believed that it was just a diversionary destroyer attack. Oddly enough, one of the messages that was completely true was not even forwarded to Jellicoe, and this was the message sent by Scheer to arrange for Zeppelin coverage over Horn's Reef for his approach. This was extremely important and should have been forwarded to Jellicoe because it would have told Jellicoe exactly where Scheer was going. However, it is unknown if Jellicoe would have believed this message and acted on it. All of this really comes down to those miscommunications earlier in the battle, and I think it also points to the relative newness of Admirals and Intelligence Services being able to communicate about enemy movements in real time and a slight mistrust in general between the two groups. Before I started researching for this episode I did not know how naval night fighting occurred in the early 20th century. It was very different than what is done now, or even in World War 2 because the advent of radar completely removed the need to visually see the enemy. In fact during World War 2 some navies even had autocorrecting fire control computers that could adjust future shots while shells were still in the air. All very impressive. If you are looking for a good book on a World War 2 naval battle, I suggest Last Stand of the Tin Can Sailors by James Hornsfischer which covers the Battle of Samar. However, this is not a World War 2 podcast, and in 1916 none of that fancy radar stuff existed. This meant that there were a few problems that necessitated some specific procedures to allow for night time fleet actions. The first problem was simply telling friendly and enemy ships apart. Jellicoe would mention this as one of the primary reasons that he did not want to pursue any actions during the night “our own destroyers would be no effective antidote at night since . . . they would certainly be taken for enemy destroyers and fired on by our own ships.” The general method of identifying ships in the dark was to flash signals via lamp, and then expect a very specific set of signals in return to confirm the identity of the ship. If the proper signal was not sent you could assume that the ship was hostile. This process would be used in the upcoming action. So, if a ship was able to figure out that another ship was an enemy, how did it shoot at it? Well, first of all it is important to remember that engagement distances were much much smaller at night, rarely more than the distance that searchlights could illuminate. Searchlights on the ships were both good and bad, they were great for illuminating a nearby target, but they broadcast the light's position far further than it allowed the men to see. Much like taking a flashlight out at night, it lets you see a bit in front of the flashlight, but somebody can see you far faster than you can see them. To try and counter this problem with searchlights they were often almost entirely covered except for a very small area of light that would shine out in a concentrated beam. If a ship was spotted by this small beat the searchlights would be unveiled and the light would shine out in full while the guns started firing. For the two navies at Jutland this was the plan for both navies, but it was well known that the Germans were better at night fighting. This came first from their training, they focused far more on night actions than the British, but it also came from their tools. Jellicoe would record that “It was known to me that neither our searchlights nor their control arrangements were at this time of the best type,” With an advantage in search lights the Germans could come out massively ahead during the night, but they did not really want to engage in heavy fighting because the first priority was to get away. For the night of cruising Jellicoe had put some of his destroyers behind the Grand Fleet to act as part of their screen. A bit before midnight the leading elements of the High Seas Fleet started to run into these ships. Following the established process the British destroyers waited until the ships got close and then flashed the recognition signals. When this happened 3 German battleships and 3 light cruisers all started firing almost simultaneously on the destroyer Tipperary. Unfortunately for the men aboard it was not a long way to Tipperary and within 4 minutes just one German battleships emptied 150 5.9 inch shells at the destroyer. The British destroyers did the only they that they could do in this situation, they fired their torpedoes and tried to disengage. Here is Robert Massie from Castles of Steel describing the actions of one of the destroyers "The destroyer Spitfire, which had been just astern of Tipperary, found herself confronting the dreadnought Nassau. Tormented by the torpedoes, Nassau turned at full speed to ram. The two ships collided port bow to port bow, the impact rolling the destroyer over, almost, but not quite enough, to swamp her. Then, alongside her little antagonist, Nassau fired her two huge forward turret guns. She was too close; the gun barrels would not depress sufficiently to hit the destroyer with shells, but even so, Spitfire bore the weight of Nassau’s rage. The concussion of muzzle blasts at close range and maximum depression swept away the destroyer’s bridge, foremast, funnels, boats, and searchlight platform. Everyone on the bridge except the captain and two seamen was killed. Then, with a screech of tearing metal, the dreadnought surged down the destroyer’s port side, bumping, scraping, and stripping away everything including boats and davits, “and all the time she was firing her guns just over our heads." Somehow the Spitfire actually survived this encounter, and even though it could make only 6 knots it would arrive back in port 36 hours later. Unfortunately 5 other destroyers were not as lucky. Only 8 torpedoes were fired at the Germans and none of them found the mark. After this encounter that group of destroyers was completed scattered and was not able to regroup during the night. Around this time the British armored cruiser the Black Prince somehow ended up running smack into the entire German fleet. It did not answer when it was challenged for the recognition signal which caused the Germans to unveil their searchlights to illuminate the British ship and at just 1,000 yards they opened fire. It was almost impossible to miss and it took just 4 minutes before the ship exploded with all hands lost. Overall, neither of these actions were horrible for either side. A few destroyers and cruisers were not a huge price for the British to pay in this case if they had been able to capitalize on the information that the destroyers could have provided. However, closer to the front of the Grand Fleet there seemed to be no reaction to the clashes at the back, which begs the question of why. After making his way through the second destroyer attack Scheer could take a nice sigh of relief even if he did not know it at the time. Shortly after though he knew that he was probably out of danger when he arrived at the entrance of the German minefields. For the German ships getting through the minefields was a great moment, some of them barely made it. The battlecruisers were the worst off, some of them have fallen behind the rest of the ships in the dark. Specifically the Lutzow and the Seydlitz. The Seydlitz was able to continue to limp towards port, ending up going around the British fleet the opposite direction of the rest of the German ships. Luck was definitely on the side of the Seydlitz and the ship was able to continue and was successfully run aground near the Weser river. The Lutzow on the other hand was not quite as lucky. It became clear to the captain on the Lutzow about 1AM that the ship would not be able to continue as there was more than 8,000 tons of water already in the hull and that number was just increasing as time went by. The Captain had to order the crew to abandon ship onto 4 destroyers that were ordered alongside for the purpose and once all men were evacuated the Lutzow was scuttled, and it would be the only German battlecruiser that was sunk during the battle. Back with the High Seas Fleet at the entrance of the minefields Scheer ordered the remaining battlecruisers through first before following them up with the predreadnoughts and then finally the rest of the fleet. On the British side Jellicoe hoped throughout the night that he would be able to resume action in the morning, however, when the sun finally came up the sky was gray and the fog made visibility until 4,000 yards. Under these conditions Jellicoe felt that he was unable to push forward into the area around Horns Reef, the danger from German mines and destroyers was judged to just be too great. All that could be done now was to turn north, go over the area od the battle to pick off any stragglers and to rescue any survivors before heading home. Jellicoe radioed the Admiralty to let them know he was coming home and all over the British ships the path home was a time for rest for the sailors who had been at battlestations for almost a day. Beatty would be recorded as saying on the way back, after slumping in the chart house of his ship with exhaustion that "there is something wrong with our ships" and the disappointment on all of the British ships was palpable. One other grim task remained for the men of the Royal Navy before they returned home. It was the tradition of the Royal Navy required that all of the dead sailors had to be buried at sea before the ships returned to port. It was a long day of burials as their bodies were committed to the deep. And with that, the battle of Jutland was over. In terms of numbers the battle of Jutland ended with the following. On the German side there were 3,058 casualties, with one battlecruiser the Lutzow, one predreadnought the Pommern, 4 light cruisers and 8 destroyers were sank. For the British there were 6,768 casualties with three battlecruisers the Indefatigable, the Queen Marry, and Invincible, 3 armored cruisers, and 8 destroyers sank. The huge difference in casualties on the British side was almost entire due to the fact that the three battlecruisers blew up, killing all on board. The British lost more ships, however, on the day after the battle the British came out ahead. The German battlecruisers were so heavily damaged that they were stuck in drydock for months, even some of the German dreadnoughts would be stuck under repair for the immediate future. On the other side the British were back to full strength quite quickly. The drastic advantage that Britain had in ship building capacity is best shown in the fact that for several of the ships that were damaged at Jutland, when they arrived at dry dock for repairs they were instantly replaced by ships that were coming out of the very same docks. By the end of 1916, the British had a larger advantage that they had before Jutland. Lets talk about those battlecruisers. The battlecruisers as a concept came to prominence in the years before the first world war, thanks partly to Lord Fischer of the Royal Navy who long championed them. The general idea was that the battlecruisers were fast enough to catch any dreadnought that was currently on the seas, they were therefore very useful for scouting purposes. They were then also equipped with guns large enough that if those dreadnoughts were found they could be engaged while larger ships caught up. However, at the time this was only possible by making sacrifices, for the British made the decision to sacrifice armor and survivability. They believed that their speed would protect them from most of the shells that were coming their way. On the German side they made the opposite decision and instead of sacrificing armor and protection they sacrificed hitting power with smaller and fewer guns. In fact, the Derfflinger had roughly the same armor as the Iron Duke, Jellicoe's flagship at Jutland. With these fact in mind it is probably easy to see why the German battlecruisers at Jutland seemed to be able to survive massively more punishment than their British counterparts. WW1 was the war of the battlecruisers, as by 1939 the concept was very much out of vogue although they would still exist in the Royal Navy. 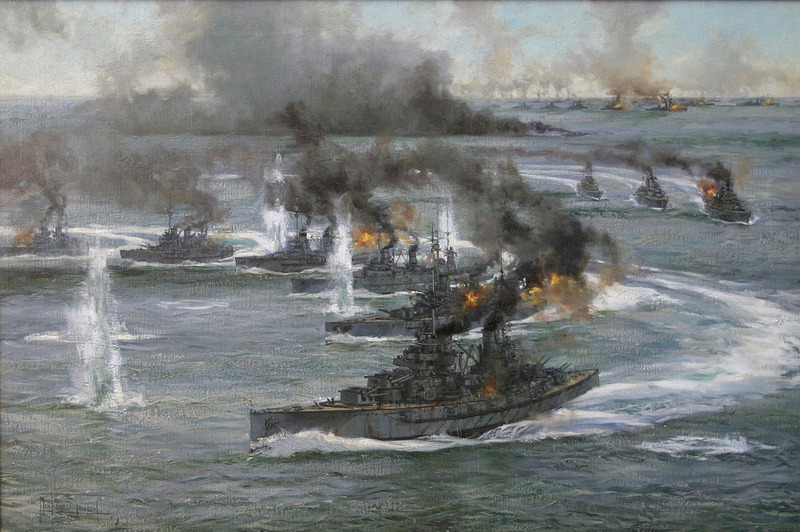 Jutland would go down as their greatest battle, since they participated in more fighting than any other ships, which inevitably leads to the discussion of why the British battlecruisers had a tendency to explode. Beatty would notice this as well, and when he said that there was something wrong with the British ships he seems to have meant that they liked to explode. The root of this problem was all the way back pre-war gunnery competitions held by the Royal Navy where the men were encouraged to get as many rounds down range as possible during the allotted time. This caused the crews to continually find ways to optimize the delivery of shells and powder to the guns. One of the way that his was done was to find ways to get around safety features like, say, the fire doors that were put in place to protect the magazine from explosions in the turret. Eventually many of these doors were just completely removed and when the battle would start they would be sorely missed. This actually had happened to some degree in the German Navy as well, but whereas the British battlecruisers did not have any problems before Jutland the Germans did. Back at the battle of Dogger Bank a British shell had penetrated one of the Seydlitz's turrets, and the ship almost exploded, only a very quick flooding of the magazine saved the ship. The Germans, realizing how close the situation was, made sure that all of their anti-flash and fire doors were in place and in good condition and also educated all of the sailors about the importance of these protective devices. The British did not have this lesson learned before Jutland, although they certainly did afterwards. All three of the British battlecruisers would be destroyed because of this exact problem. For the battlecruisers as a whole though, as I mentioned they would fall out of favor after the war for a few reasons. Dreadnoughts, or battleships as they would be called, just became faster and it became clear that the speed of the glass cannon battlecruisers was no longer a sufficient advantage to make up for their downsides. The last battlecruiser, the HMS Hood, would be created for the Royal Navy in 1920 and would find its end at the hands of the Bismarck. On the German side the evaluation of the battle resulted in the two commanders receiving very different grades. Hipper was almost universally praised for the performance of his ships. They had done extremely well, they had landed many hits on Beatty's ships early in the fighting and had been responsible for most of the damage caused to the British ships. Their effectiveness had only been reduced after the arrival of Evan-Thomas when they began to receive a lot of damage. However, the survivability of the German ships was shown to be a great asset of the seas and it proved the German theory of battlecruisers to have merit. To some extent you could say that Hipper was the only commander who won his phase of the battle, with the sinking of the two battlecruisers I do not think there is too much of an argument that he did not get the better of Beatty early in the fighting before more British ships appeared. Scheer on the other hand came under far more criticism than his battlecruiser commander. His position had not been great from the start, he had the smaller fleet and it is difficult to see how he could have come out as the victor. However, much of the criticism did not focus on this and instead focused on his second turn back into the British. While it turned out okay because his ships survived it was a huge risk that could have had horrible consequences. Scheer would continue to command the High Seas Fleet and would continue to perform well for the rest of the war. He would continue to try and find a way to put the Royal Navy in a disadvantageous situation without success for the rest of the war. For the Royal Navy Jutland would be the topic of conversation for the next two decades. The biggest reason for its much greater emphasis in Britain was due to expectations. The Royal Navy was expected to find its enemy, engage it using its superior power, and destroy it, any other outcome was not sufficient. It was the entire reason that the Royal Navy existed, the entire reason that so much money had been spent on its ships, its training, and its men. The news of the battle reached London on the morning of June the 6th. Jellicoe would write that "My luck is out for the present." There were several problems that quickly came to light, the first of which was the battlecruiser problems mentioned above. But this was not the only problem, another one was some problems with the armor piercing ammunition used by the ships. These shells had a tendency to explode the instant that they hit the armor instead of having delayed detonation that allowed them to penetrate some armor and into the softer parts of the enemy ships. While these types of problems were discussed a bit after the battle, and in general quickly rectified the controversy would not end there. The longest lasting discussion would be focused on finding blame for the failure of the Grand Fleet to completely destroy the High Seas Fleet. The two obvious focuses for this blame were Beatty and Jellicoe, and after the war they would also get in on the argument. During the war both men kept their thoughts generally to themselves, or at least they did not make their thoughts public, but post war was a different situation. Beatty was angry because he felt that because Jellicoe had been so cautious in the later stages before darkness set in that Beatty had been robbed of his great victory that he obviously deserved. Jellicoe was heavily criticized for his decision to turn away from the German fleet during the torpedo attack and also criticized for failing to be able to re-engage the German fleet afterwards. However, as Jellicoe would discuss in his memoirs about the battle the clock and the weather were both strongly against him finding the German ships again. Much of the postwar literature fell strongly on the side against Jellicoe, and this has affected historians and how they portray the battle to this day. One of the reasons for this was Beatty's previous reputation from the other battles, which put him in a much better place in terms of public relations than his superior. He also had cultivated much better connections in the press which gave him a head start in shaping the story. Recent works on the battle have tended toward a more middle ground in their evaluations of the fighting with the blame being put more on the environmental situation instead of the British commanders themselves for not being able to close the deal on the German fleet. It was an extremely important 48 hours for both fleets in the North Sea and it would be the topic of study for countless historians ever since. In the end it would be known just as much for its indecisive result as for the actions that took place. This brings us to the end of our episodes on Jutland. I hope you have enjoyed our trip to the North Sea and next week we will go to a city we have not visited up to this point in the show because in the spring of 1916 there would be an uprising of rebels in the British empire, however the city is not in one of the Empire's far flung colonies but was instead much closer to home, in Dublin Ireland.